Prof. Chan Shui-duen, Associate Dean of Faculty of Humanities, was re-appointed as member of the Standing Committee on Language Education and Research (SCOLAR) for a period of two years with effect from 1 July, 2013. 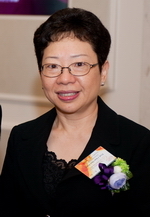 Prof. Chan has been an appointed member of SCOLAR since July 2009 to advise the Government on language education issues. As a language scholar, Prof. Chan will continue to help SCOLAR in promoting biliteracy and trilingualism and maintaining quality language education in Hong Kong. This e-newsletter is published by PolyU's Communications and Public Affairs Office.